GUNJAN PORWAL, an engineer by day, and writer by night who is fascinated by Indian mythology, especially the Mahabharata and Ramayana. After graduating from the Indian Institute of Technology, Kanpur in 2002, Gunjan worked in MNCs as an engineer while contemplating writing anything other than code. Gunjan lives in Pune with his wife, children, and parents. 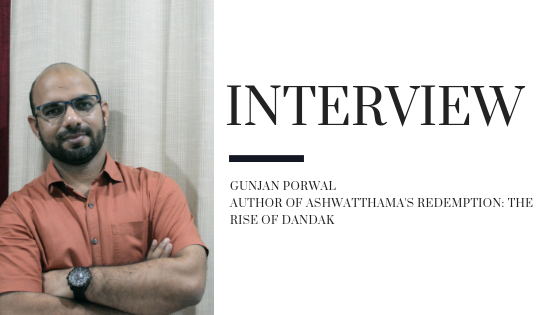 Ashwatthama’s Redemption: The Rise of Dandak is his debut novel. LiFT: When did you realize that you want to be a writer and what’s your inspiration behind it? Gunjan: It was sometime in 2009. I was quite inspired by Dan Brown digging into Christian mythology and connecting it with contemporary science. I wanted to write something on the lines of that, but couldn’t start until 2014. Somehow it struck me that the punishment meted out to Ashwatthama was far more than his crime. And he was not perceived positively after that. That gave me the inspiration to project him in a positive way. Gunjan: As we are moving towards a more open system in terms of self-published books, it is giving more and more opportunities to budding writers. On one hand, it is excellent that people are getting a channel to voice their creative side out, on the other side, it also clouds a lot of good literature that gets lost in the crowd. I hope that good literature continues to flourish, and people continue to flock to it. I also feel its the writer’s responsibility to bring out something creative. Gunjan: Quality of a book is definitely a MUST HAVE. One cannot afford to have the motivation or many plot holes in the book and expect it to be accepted by the reader. That being said, in today’s world, marketing plays a good role in how books fare on the shelf. There are lots of good books out there, but without marketing, they are biting the dust. That is an unfortunate truth. As easy as it sounds, I realized marketing is also one of the toughest parts and takes lots of time. 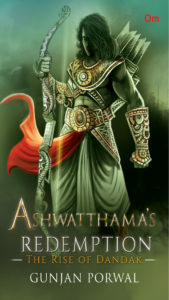 Gunjan: My thought when writing this book was that Ashwatthama was punished too harshly for his crimes. So he deserved a second chance. Like that, all of us in life deserve second chances, if we are genuine about out repentance. None of us is perfectly good or bad. We all have our grey areas. Gunjan: As for hobbies, I am a movie geek. I like watching thrillers, political drama and sometimes no-brainer action movies. However, I also like to read whatever I can get my hands on – books, newspaper, Quora, and so on. Among books, I am more inclined towards science fiction, fantasy, mythology and again thrillers. Gunjan: Ah… the Writer’s Block. Every writer’s worst moment. I take different approaches. Sometimes I have to write down the different ways the story can go from a particular point. Other times I just stare blankly on the wall, trying to think of ways I can get the story moving forward somehow. But the best approach that has worked for me is taking a break. Later I try to continue on the story while taking a walk around the park. It clears the mind and gives me a fresh perspective, and sometimes that has given me lots of fresh ideas. Gunjan: I would like Tiger Shroff as Ashwatthama since he can be both brooding and aggressive. He can display myriad of emotions in the current generation and can carry a serious and action-packed role with quiet finesse. For directors, if a movie gets made, it would belong purely in the mythology genre, and SS Rajamouli is the best person today to handle that genre. LiFT: What are your future plans? Gunjan: Right now, I am working on the sequel of the book. I have a science-fiction draft I wrote a couple of years back, but it needs lots of research. I have few more mythology based ideas in rough format, but I can only flesh them out after completing the Ashwatthama series. LiFT: What are your suggestions to the budding writers so that they could improve their writing skills? Gunjan: I think the most important thing that budding writer can do is to read and write. I do not see anything else that helps a writer more. Reading gives perspective on what works and what does not. It also helps understand the quality of work out there in the market. Writing is a learning process. The more you write, the more you learn. And if you start early, you give yourself time to rewrite parts of the story, which becomes a necessity.